I LOVE shisha mirror embroidery and the shisha stitch. This little fob was my first Shisha (and goldwork) project several years ago, the pattern was from an old issue of an Australian magazine and it took me a long time to track down the materials. It's a little worse for wear these days and part of me wants to make another one because I know I could do it better, now. I'm putting a few on as impact/accent on my new freestyle project, which will remain nameless for the time being. But I love these little shishas so much thought I'd share a hint of them now. 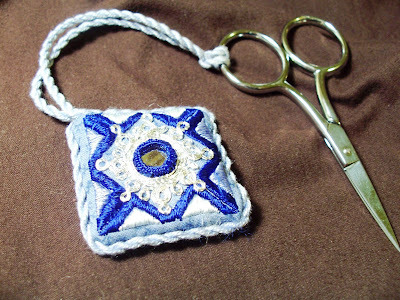 Attaching Shisha mirrors using Shisha stitch is simple, but a little fiddly and does take practice. If you're interested in Shisha, the best instructions I've found are in select back issues of my favorite magazine, Stitch with the Embroiderer's Guild out of the U.K. (linked above), or in the hard-to-find book Sadi Thread & Shisha Glass Embroidery by Betty Luke. In other news I can not wait for my other camera to be repaired and sent back to me, this old one is that much more difficult to focus and take true color pictures, and eats AA batteries by the handful. NOM NOM. Nice work on your shisha mirrors!